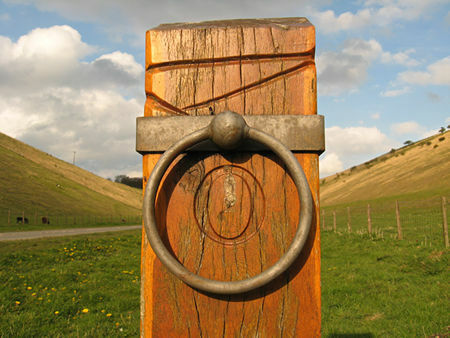 The Yorkshire Dales and Yorkshire Moors are famous, the undulating Wolds less well-known. Which may change soon, as they’ve been ‘bigged up’ as a result of ‘Bigger Trees Near Warter’ and other David Hockney paintings. I fear the quiet landscape may soon be littered with informational signs pointing out places associated with paintings. As it is now, you can follow rights of way through this landscape and meet no one at all for hours. It can be nice to find man-made structures in the middle of rural landscapes, if they’re quirky, arty, and slightly mysterious. These stones, at the edge of a field near Huggate, I had read a little about. A Google search reveals various interpretations, including that they’re ‘advertising signs’ and that they’re strange and ancient. Actually, they’re about as old as I am. 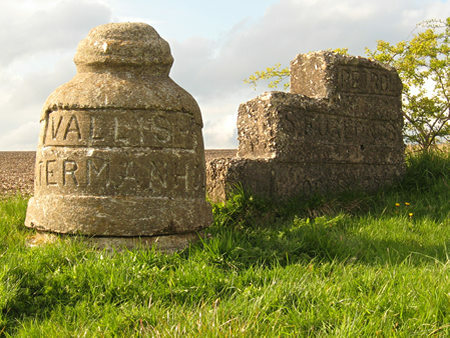 I often feel ancient, but date from the 1960s, as do these concrete markers, placed here by a witty farmer. 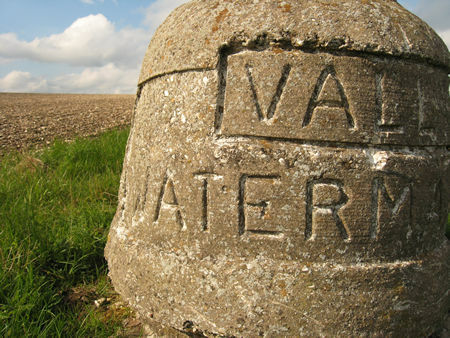 They have Latin or Latin-like inscriptions like ‘VALLIS WATERMANHOLE MAGNA’. The stepped one says ‘PETROL – 5 FURLONGS’. More recent, and noticed as we drove back via the road to Millington, are these very handsome waymarkers, of wood and metal. Rather intriguing, placed in the landscape with no explanation. I later found information on their construction and meaning, which you can read here. By Lisa @YorkStories • 27 April 2012 Beyond York, Details, Signs and symbols To link to this page's proper location please use the > permalink. « The Arts Barge Project. Can you float their boat? The stepped one is quite funny, shaped as it is, like a horse-mounting block. I’ve always loved walking in the Wolds; our school had a walking club, and while we’d go over to the Lake District or up on to the North York Moors for multi-day adventures, we’d walk the Wolds for one-day trips. Quite a different atmosphere. The Wolds are perfect for manageable walks, aren’t they, as you say, perfect for one-day walks (or indeed just an afternoon, as was ours). We used to head up to the Dales or Moors, when first looking for good places to walk, but have to say that these days I find the Wolds more interesting. Also the Howardian Hills area.